Hedge funds are known to underperform the bull markets but that’s not because they are terrible at stock picking. Hedge funds underperform because their net exposure in only 40-70% and they charge exorbitant fees. No one knows what the future holds and how market participants will react to the bountiful news that floods in each day. However, hedge funds’ consensus picks on average deliver market beating returns. For example in the first 2.5 months of this year the Standard and Poor’s 500 Index returned approximately 13.1% (including dividend payments). Conversely, hedge funds’ top 15 large-cap stock picks generated a return of 19.7% during the same 2.5-month period, with 93% of these stock picks outperforming the broader market benchmark. Interestingly, an average long/short hedge fund returned only 5% due to the hedges they implemented and the large fees they charged. If you pay attention to the actual hedge fund returns (5%) versus the returns of their long stock picks, you might believe that it is a waste of time to analyze hedge funds’ purchases. We know better. That’s why we scrutinize hedge fund sentiment before we invest in a stock like Citrix Systems, Inc. (NASDAQ:CTXS). Citrix Systems, Inc. (NASDAQ:CTXS) was in 36 hedge funds’ portfolios at the end of the fourth quarter of 2018. CTXS shareholders have witnessed a decrease in hedge fund interest lately. 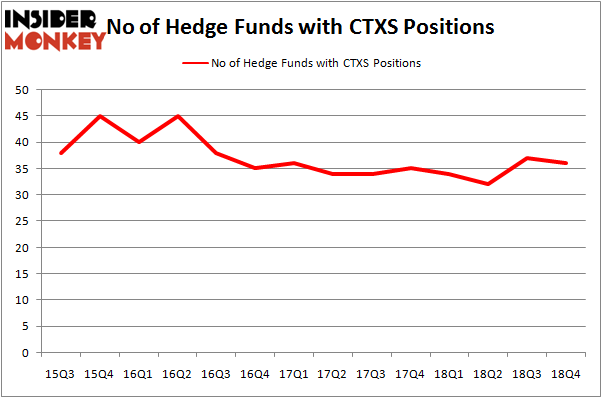 There were 37 hedge funds in our database with CTXS positions at the end of the previous quarter. Our calculations also showed that CTXS isn’t among the 30 most popular stocks among hedge funds. 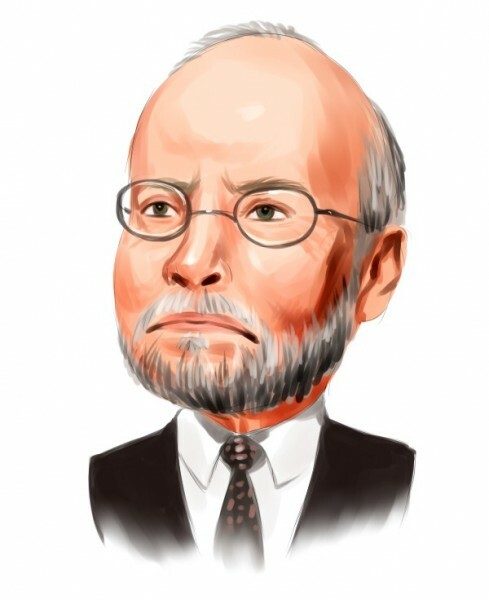 Let’s check out the latest hedge fund action surrounding Citrix Systems, Inc. (NASDAQ:CTXS). What does the smart money think about Citrix Systems, Inc. (NASDAQ:CTXS)? At the end of the fourth quarter, a total of 36 of the hedge funds tracked by Insider Monkey were bullish on this stock, a change of -3% from the second quarter of 2018. On the other hand, there were a total of 34 hedge funds with a bullish position in CTXS a year ago. With hedgies’ positions undergoing their usual ebb and flow, there exists a few noteworthy hedge fund managers who were boosting their holdings significantly (or already accumulated large positions). The largest stake in Citrix Systems, Inc. (NASDAQ:CTXS) was held by Elliott Management, which reported holding $624.1 million worth of stock at the end of September. It was followed by GLG Partners with a $211.3 million position. Other investors bullish on the company included D E Shaw, Two Sigma Advisors, and Farallon Capital. Seeing as Citrix Systems, Inc. (NASDAQ:CTXS) has experienced a decline in interest from the entirety of the hedge funds we track, we can see that there exists a select few hedgies who sold off their positions entirely heading into Q3. Intriguingly, Daniel S. Och’s OZ Management said goodbye to the biggest position of the “upper crust” of funds watched by Insider Monkey, comprising close to $162.1 million in stock. Bain Capital’s fund, Brookside Capital, also said goodbye to its stock, about $72.9 million worth. These moves are intriguing to say the least, as aggregate hedge fund interest dropped by 1 funds heading into Q3. Let’s now review hedge fund activity in other stocks – not necessarily in the same industry as Citrix Systems, Inc. (NASDAQ:CTXS) but similarly valued. These stocks are Ryanair Holdings plc (NASDAQ:RYAAY), KLA-Tencor Corporation (NASDAQ:KLAC), L-3 Technologies, Inc. (NYSE:LLL), and CBRE Group, Inc. (NYSE:CBRE). All of these stocks’ market caps are similar to CTXS’s market cap. As you can see these stocks had an average of 24.5 hedge funds with bullish positions and the average amount invested in these stocks was $816 million. That figure was $1995 million in CTXS’s case. CBRE Group, Inc. (NYSE:CBRE) is the most popular stock in this table. On the other hand Ryanair Holdings plc (NASDAQ:RYAAY) is the least popular one with only 9 bullish hedge fund positions. Compared to these stocks Citrix Systems, Inc. (NASDAQ:CTXS) is more popular among hedge funds. Considering that hedge funds are fond of this stock in relation to its market cap peers, it may be a good idea to analyze it in detail and potentially include it in your portfolio. Our calculations showed that top 15 most popular stocks among hedge funds returned 19.7% through March 15th and outperformed the S&P 500 ETF (SPY) by 6.6 percentage points. Unfortunately CTXS wasn’t in this group. Hedge funds that bet on CTXS were disappointed as the stock lost 1.2% and underperformed the market. If you are interested in investing in large cap stocks, you should check out the top 15 hedge fund stocks as 13 of these outperformed the market.